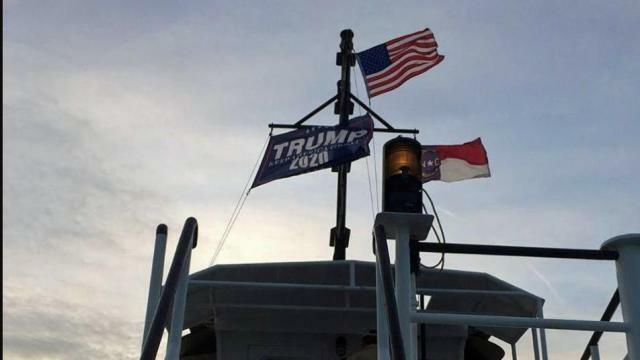 HATTERAS, N.C. — Officials with North Carolina’s ferry system have suspended a boat captain and crew member for a week after they hoisted a flag supporting President Donald Trump’s re-election on a state-owned ship. Oh, but it is ok to splash the rainbow flag in lights on the Whitehouse? Was there really a time when we all adhered to the same rules ? I thought there was but the memory has become so fuzzy that it seems kinda like it was a dream, and yet the nightmare, for sure, is real. Do as the left says, not as they do, and you can always tell what they are doing, because it is whatever they are accusing conservatives of doing.